"I met my husband accidentally while working on a China-Japan project from 1994-1998," said Mrs. Sun. "I looked at this handsome Mongolian boy who had just returned from studying in Japan and thought: I'm going to marry him." And she did. Five years later, when she was thirty one she had a baby boy with him. I questioned my Chinese friend about her marriage. "It's really a very good match," she confided. "And we were lucky to both have studied Japanese because his Mandarin at first was quite terrible. If he did not understand my Mandarin we used it to communicate." "What did your family think of you marrying an Inner Mongolian?" I queried. "Oh that really doesn't matter," she promptly replied. "Everyone now is free to choose the best possible mate, and people are treated the same, without prejudice. I actually think I'm better off with him because we are so different. If I'd married a Han I would have learned his character faults a lot faster. My husband is so different, I find that appealing. We can learn from each other all the time." "What's the biggest cultural difference you perceive between Han Chinese and Inner Mongolian people?" I asked her. "Well, I can only speak for myself," she began. "But you know, as a Han I'm careful, precise, and meticulous -- maybe because Han people are from a farming culture? I do things with a plan and a schedule. My husband likes to jump the plan and skip a step. That throws me out of whack, so we argue. I guess as a man from a nomadic culture his ideas concerning planning and timing are very different than mine. But we work things out and I love him deeply." "What do you cook for your husband?" I probed. "Of course I cook Chinese food, and he loves it. But for breakfast we eat Mongolian: millet mixed with cream and yogurt, cheese and milk tea. Sometimes I cook roast lamb or beef stew because it is delicious and my husband, as a Mongolian, likes mutton and beef very much. We rarely eat pork; he doesn't like pork or fish." "And your child? How will you raise him?" I asked. "Han and Mongolian people both love children very, very much," she began. "The style of child rearing is pretty much the same. I have taught my son a few Mongolian numbers, just as my husband taught me. But he will go to a Chinese school and learn Chinese very well; it's a much more important language. Maybe when he visits his grandparents on the grasslands he will pick up some Mongolian language and culture. But I'm Chinese and he is my son." "I married him because he chased me," Na Ri Su explained, smiling. "He just would not give up, and I finally let him court me." "I had no choice," retorted her husband. "You are the most beautiful woman in Hohhot." I grinned, watching this handsome young couple. Na Ri Su was my colleague, a long limbed, tawny skinned Mongolian beauty. She taught English at my university. "Will your son grow up as a Han or as a Mongolian?" I asked. "I'm half Mongolian but I cannot speak it," she confessed. "I speak English and know a little German but I only faintly understand Mongolian. It is a shame, really." "Chinese is more important," interjected her husband. "The world may soon all be speaking Chinese if our economy continues to boom. Mongolian is for isolated linguists." "That may be true," replied Na Ri Su. "But I feel sad that I have lost a part of my culture. I cannot give it to my son, although I give him a Mongolian name, a Mongolian hair cut and Mongolian clothes, even Mongolian toys." "He is better off as he is than he would have been as a Mongolian a hundred years ago," her husband contended. "This is modern life, we must go forward and adapt." "Yes," she sighed. "I guess you are correct." 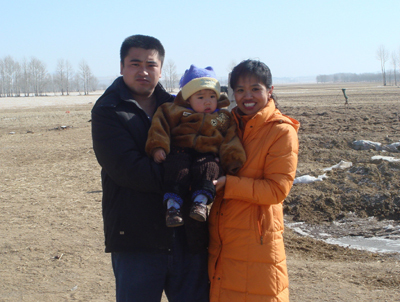 "Of course I hope that my two children will marry Mongolians," sighed Mrs. Lin Yu Bao. "But we are living in a different era than before. I married a Mongolian because I am Mongolian; I had very little choice. My son and my daughter are in their twenties now. He is at a Chinese university in Sichuan and my daughter is studying in Japan. I cannot control them; they are free to make their own choices." "Do your children speak Mongolian?" I asked. "Not really. I did not send them to a Mongolian school because I was too busy trying to advance my career. I sent them to the university kindergarten; it was cheaper and convenient. But my kids understand a little Mongolian. In any case I'd rather they study a major language, like English or Japanese." "How has life changed for Inner Mongolians since you were born fifty years ago?" I queried her. "Life is much better," she answered vehemently. "I was born on the grasslands, it was not easy. My grandparents were nomadic herdsmen. Everything changed right before I was born when the Communists took over. Mongolians settled down in one place. I studied in Chinese at the primary school. Later, after I graduated from college I started working here at the university and I joined the Party." "Mongolians can join the Communist Party?" "Anyone can join; if you apply and have good character you will be accepted. There are many minority people in the Party," she explained. "How did you learn Mongolian?" I asked. "Only at home, and speaking with friends," she said. "What do you eat?" I queried. "Of course I eat Mongolian food: lots of millet, boiled mutton, milk tea and dairy products, especially yogurt. I eat Chinese vegetables too, but I do not like pork, so I never cook it at home. My children, however, eat everything." "What about Mongolian culture; are you a Buddhist?" I probed. "I'm an atheist," she stated. "True, most Mongolians are Buddhists, they follow the Tibetan Buddhist rituals. I do practice some things my grandmother taught me: for Spring Festival I face the four directions and throw a milk blessing to the universe. And when my parents died I followed Tengrist practices for the allotted three years. You know about this?" "No, please explain," I urged her. "Tengriism was the ancient belief of all Mongols; it is still actively practiced in Mongolia, in parallel with Tibetan Buddhism. The meaning of life is seen as living in harmony with the surrounding world. Tengriist believers view their existence as sustained by the eternal blue Sky, Tengri, the fertile Mother-Earth, Eje, and a ruler who is regarded as the holy Son of the Sky. Heaven, Earth, the spirits of nature and the ancestors provide every need and protect all humans. By living an upright and respectful life, a human being will keep his world in balance and maximize his personal power. Mongolian shamans play an important role in restoring balance when it is thrown off by disaster or spirit interference." "So you do believe in something even though you are an atheist?" I asked. "Yes, I am a Mongolian and I will always be one, so these concepts are very powerful to me. But my children are modern people; they do not hold such ideas. Not just China and Inner Mongolia but the whole world is changing so fast." "Yes, we speak Mongolian," said a group of six young girls in Teacher Yang's English class. "We come from the grasslands, Hulun Buir, and our families are 100 percent Mongolian. We grew up speaking Mongolian." "Is it important to you?" I asked them. "Yes, indeed," they chorused. "We take pride in being Mongolian. Our parents sent us to bi-lingual schools, and we want to marry Mongolian boys." "How about you?" I looked at a handsome young man. "Yes, I prefer a Mongolian girl," he admitted. "There are cultural differences between Han and Mongolians. And Mongolian girls are prettier to me." The girls all laughed. One, with waist length hair, murmured, "Our parents really made an effort to preserve the language and culture for us. Nowadays everyone is equal but in their time things were harder. So we should respect our elders, keep our culture and language." All the young Mongolians nodded vigorously. "Yes," added the youth. "Without our culture who are we? Just like grass in the wind, blowing aimlessly. But as Mongolians we are joined to a long history connected to Genghis Khan and the glorious Mongolian empire. I want to belong to that, I like being Mongolian."